On Sunday, Tori took me to Trapeze High where she works so I could try flying trapeze for the first time. 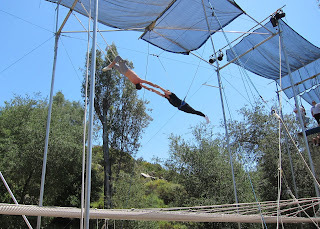 We drove to the outdoor rig in Escondido for the noon class where it was very hot and sunny. Our first ground lesson was learning the proper terminology and techniques for the take-off position and the correct swinging pose. It was a tall ladder up to the platform, but I felt excited at the top. They hooked up my safety lines as I chalked my hands and I was ready. My first swing went perfect. I was able to keep my banana pose while looking up at the bar and I felt hardly any weight on my arms. The first fall into the net was a little scary, a yelp escaping my lips as I released the bar and dropped. The net was softer than what I expected and I was relieved that my tender right shoulder didn't hurt from the swing. The second trick we learned on the ground was the knee hang with a back flip dismount into the net. 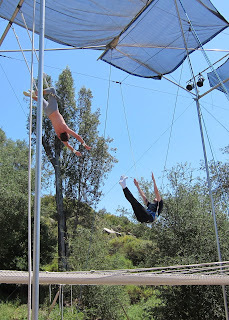 I was pretty nervous about the back flip and my first attempt was kind of a disaster. I hooked my knees okay, but instead of releasing my hands to hang down, I took my knees back off the bar. 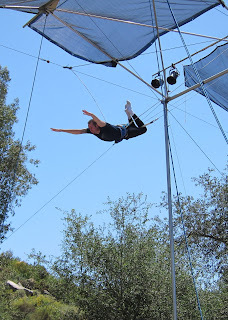 I still had enough momentum so I was able re-hook my knees and hang down on the second swing, but then I botched the leg-kicks needed for the back flip and I landed belly first into the net. After that, I was more nervous on my second attempt, but it went much, much better. I pulled off all the maneuvers in the correct order and it felt great. My only mishap was catching the safety line in the crotch as I slid off the net. Ha! My third attempt was the best. Our last lesson of the day was for the knee hang grab. On the first swing, we were instructed to get into the knee hang and stretch out for the catcher as we swung out on the second swing. I was happy that I was able to connect on my first try and stay in the proper pose underneath the catcher. On the dismount, I kicked my legs a little too hard and instead of landing on my back, I flipped over and hit the net with my face. Barely felt it. I was able to land correctly on my second grab, the sixth and final swing of the day for me. The Sunday catcher, Chris, pulled a muscle climbing the rig to retrieve a loose safety line afterwards so I was able to watch Tori shimmy up the rope to the catch bar and finish the class. I missed her catching me by one turn. 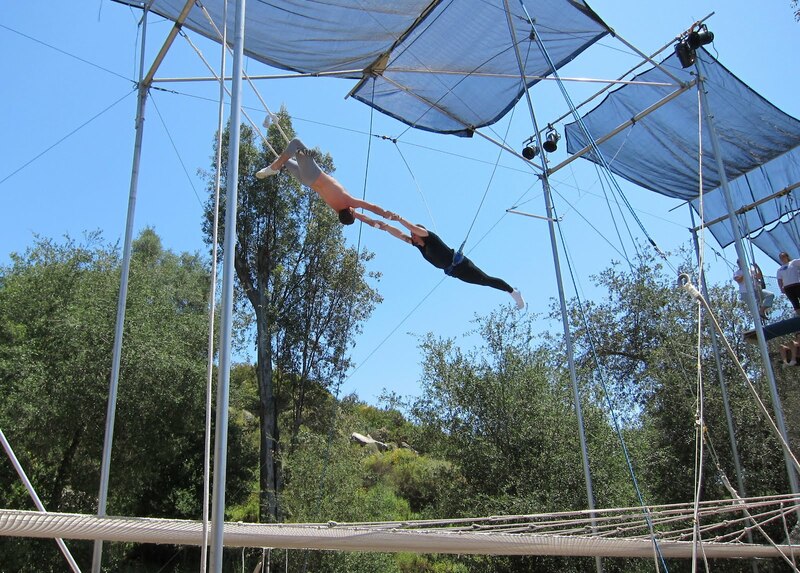 I felt great at the end of the experience, my hands and shoulder survived unscathed and I only felt a little soreness behind my knees from the hangs. Today though, I am very sore, but it's a good muscle soreness. The video of me doing the knee hang grab and landing on my face in the net. 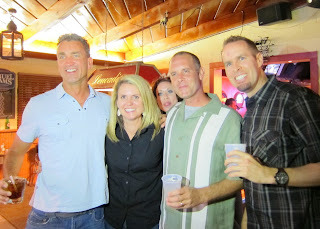 Three of my classmates from San Dieguito High School were back in town to celebrate their birthdays so John sent out a Facebook invite for a get-together at The Leucadian on Friday night, May 4th. Instead of driving, I decided to walk down to the bar along the North Coast Highway 101, taking pictures of the local businesses along the way. When I arrived at The Leucadian, it was like a miniature High School Reunion for the Class of 1990. The first thing that caught my eye when I stepped inside the bar was a beautiful women talking with classmates from my high school. Taking a closer look, I realized that I recognized her as well but I could not remember her name. I soon had a drink and became involved in other conversations with school friends, but I would occasionally glance over in her direction I as struggled to identify her. Later in the night, I happened to look away from the group I was talking with to see her standing alone behind me when her friend stepped away for a moment. I seized my chance - "Hello. I remember you from high school but I can't remember your name." She smiled and replied, "It's Tori Manning. I recognize you as well but I can't remember your name either." We immediately began chatting away about our lives since High School, how she moved away to Los Angeles after high school and then to Australia for a couple years before moving back home to San Diego. When she told me that she was a Flying Trapeze Instructor, I jumped on the chance to see her again by saying I wanted to try it. (I really did.) She gave me her card and wrote her own cell number on it so she could get me a special deal. She laughed when she described how the number spelled out "Bad Tori". As we talked, I felt this magnetic pull that kept drawing us closer and closer. I had to fight off the urge to reach out and kiss her. Her friend, Jessie who was another classmate as well, returned and I think she picked up on the vibe since she remarked that Tori and I should both travel to Antarctica together. I think she was serious. Ha! Tori excused herself to go to the restroom while I stayed and talked to Jessie for awhile. During a break in the conversation, I noticed Tori chatting with another group across the room so I ordered another beer and made my way over to join them. A little doubt had crept in when she hadn't returned. Was she really as interested in me as I thought, but Tori greeted me with a smile and we were soon were talking easily again. I don't remember most of what we shared during this time but one line stands out as we leaned against the pool table. 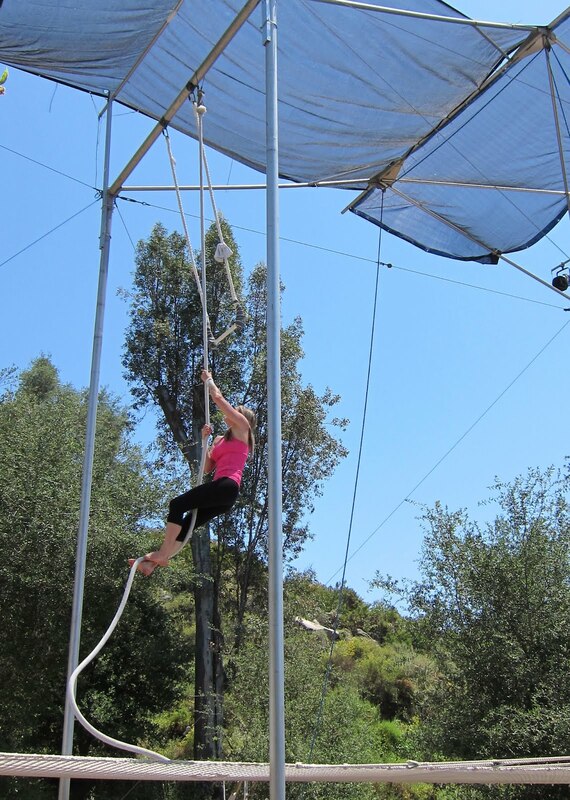 "You should call me even if you don't want to try Trapeze," she said. I hastily sputtered. "Yes, yes. I would call you no matter what." Aware that she was feeling the same way about me, I spent the rest of the evening hanging out with her in a glowing state of happiness. "Call me", Tori said as she hugged me goodnight and left with Jessie. I was so excited that I texted my best friend, Chad, as I walked home after midnight. "I made a connection tonight." As I finished up my meal, I noticed that Tori had friended me back on Facebook so I texted Chad for his advice. He confirmed that I should call her that same day and not wait. Back home, I pulled her card out of my wallet and dialed her number. I was so relieved that she picked up and I didn't have to leave a voicemail. She had just returned home from catching her Saturday Trapeze classes. We talked some more about Trapeze and the graphic design course she was currently attending before I asked her out on a date. She agreed. I was practically flying when I got off the phone. It was so easy to talk with her. Our first date was the very next weekend, Sunday, May 13th. I picked her up outside her place in Carlsbad to take her go-carting. The first available race at K-1 Speed was over an hour wait so we drove over to BJ's for a beer while we waited. Tori and I grew up in the same town and went to the same schools but we never had any classes together so we had a lot to learn about each other. It turns out we also had the same type of health-conscious parents who cooked much of the same food and we discovered our mutual love for popcorn sprinkled with Cayenne Pepper and Brewers Yeast. 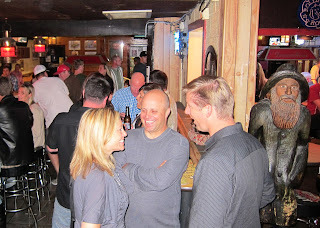 I smiled inside as we rested our knees together under the bar during the conversation. After returning for a fun race at K-1, we went over to Sushi Taisho for an early dinner where she introduced me to Seaweed Salad. I didn't want the date to end so I suggested we walk over to the beach. While we waited at the second crosswalk for the light to turn green, I could not resist any longer and I leaned in to kiss her. The floodgates opened and we could not stop kissing all the way down to the boardwalk. We made out as the sun set behind us. It was the "Best First Date Ever." I couldn't wait a whole week to see Tori again so we went out to dinner last night at Le Papagayo. We had a great meal and kissed for over an hour in the parking lot afterwards. 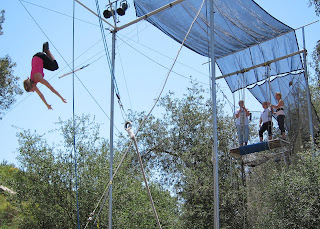 On Sunday, Tori is taking me out to the Trapeze Rig in Escondido. She claims that she is strong enough to catch me. I can't wait.